Whales have an unfinished story. The plot so far has been enthralling; they’ve evolved from four-legged dog-like terrestrial animals to up to 200-ton marine behemoths. But when you begin to ponder how these giants came to be and where they’re going, you’re left with more questions than answers. How did whales become so enormous in the first place? Can they get bigger? How did they evolve from land-dwelling animals to seafaring creatures, anyway? In his new non-fiction book Spying On Whales, paleontologist Nick Pyenson traces the story of whales across vast swaths of geologic time to begin chipping away at some of the most pervasive questions. The book is divided into three sections: one that looks at the past through whales’ 50 million year fossil record, one that tries to make sense of their present, and one that attempts to predict their future. The immense timescales of evolution are made accessible through Pyenson’s evocative writing and rich storytelling. Everything about a whale is improbable. They’ve only recently—about 4.5 million years ago—ballooned into the leviathans we know today. Blue whales, the largest creatures on Earth, can stretch upwards of 100 feet from head to tail. Though they’re closely related to cows, deer, pigs, hippos, and camels, whales are far from resembling these furry mammalian relatives. “That tells you that somewhere in their past, they had a tremendous amount of evolutionary transformation,” Pyenson, who is the curator of Fossil Marine Mammals at the Smithsonian Institution, told Earther. As Pyenson explains in the book, the fossil record suggests whales’ ancestors adapted to aquatic environments over many millions of years, ultimately losing their legs and leaving the land behind, although many details of this story remain a mystery. In addition to taking readers on a journey across deep time, Pyenson takes readers on a trek around the world with vignettes of science in action. He tells stories of wading knee-deep in whale carcasses in the middle of the North Atlantic or excavating fossils in the Chilean desert. Placed in the paleontologist’s shoes, readers are offered a glimpse of the detective-like acumen needed to piece together cetaceans’ storied history. Then there’s climate change, and all of the transformations it brings. “I’d say the biggest signal of change, absolutely, is gonna be the melting Arctic,” Pyenson told Earther. As the ice melts, cetaceans that roam Arctic waters, like Bowhead and Beluga whales, will have to compete with Atlantic and Pacific-dwelling marine mammals migrating north. Pyenson also predicts the Arctic will become a highway for shipping, resulting in a greater risk of oil spills and ship strikes. For the vaquita and the right whale, the future is already looking grim thanks to a combination of human-caused threats. Perhaps the most compelling aspect of Spying on Whales is Pyenson’s ability to convey the wonder of a fossil’s story. “Skeletons are geometrically beautiful objects,” he told Earther. 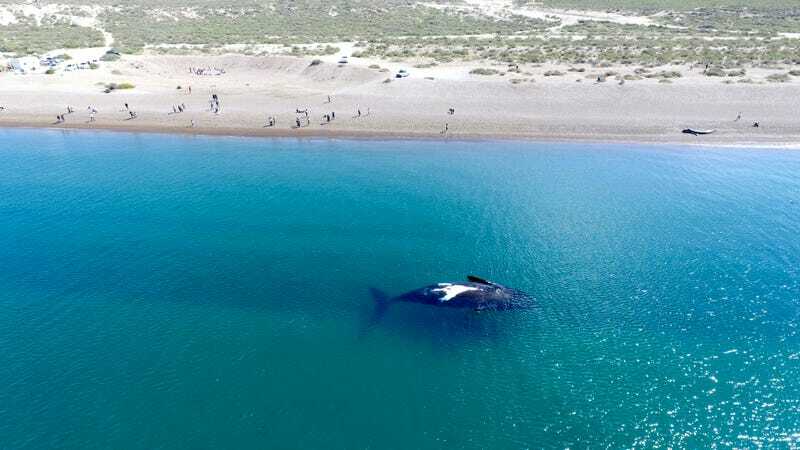 “They tell us a lot about evolution.” Though, as readers also learn, hauling back a whale skeleton after stumbling on it in the field is pretty much the epitome of a logistical nightmare. Spying On Whales went on sale June 26th.